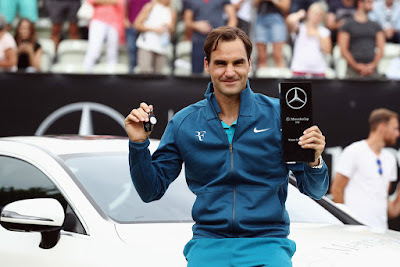 Roger Federer claimed his 98th tour-level title and 18th grass-court trophy, displayed his unrivalled superiority on grass with a 6-4, 7-6 (3) victory over Milos Raonic in the Mercedes Cup final in Stuttgart. He extending his grass-court winning streak to 16 matches dating back to victories at Halle and Wimbledon last year. 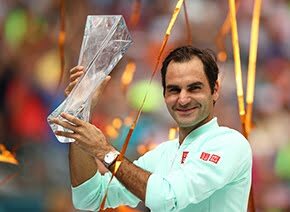 The 36-year-old, who was also victorious at the Australian Open and the ABN Amro World Tennis Tournament earlier this year, has now earned three or more triumphs in 13 of the past 15 seasons. 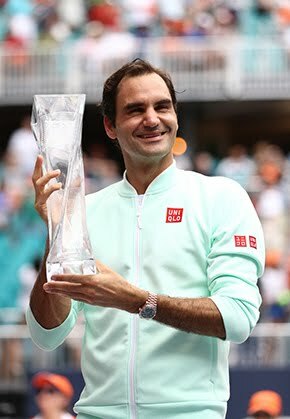 The Swiss is now 18-6 in grass-court finals, with all six of his losses coming against opponents who cracked the Top 2 of the ATP Rankings in their career. 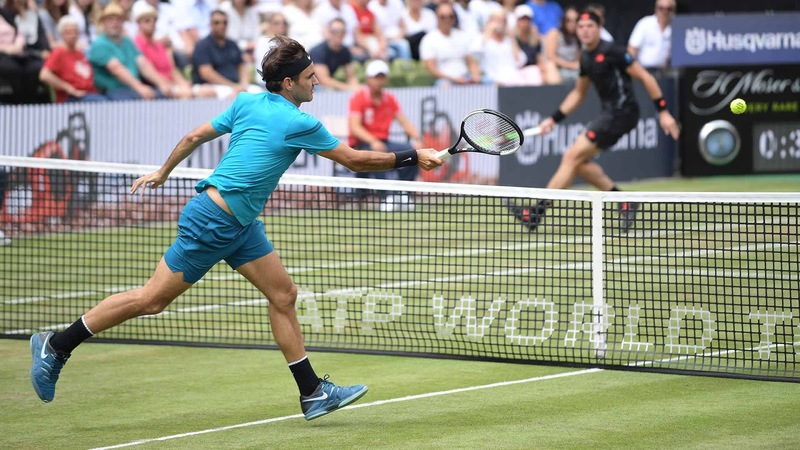 By reaching the championship match in Stuttgart, Federer guaranteed that he will climb to World No. 1 in the ATP Rankings on Monday, doing so for the third time this season. He will need to retain his Halle title next week if he is to maintain the top spot ahead of Wimbledon. Federer now leads Raonic 11-3 in their ATP Head to Head series, and 4-1 on grass courts, winning his past five sets against the Canadian. Federer dropped serve just twice en route to the title, holding on 48 of 50 attempts. He now holds a 168-24 (87.5%) tour-level record on grass. He is now 98-50 in tour-level finals. He has won 65 of those championship matches in straight sets. Raonic entered the final having won all 41 of his service games in the tournament. But Federer wasted little time making his mark on that statistic, breaking at 1-1 in the opening set with an inside-out backhand return winner. There were no breaks of serve in the second set. And it was Federer who held firm under pressure. Raonic double-faulted to give Federer a 5/3 lead in the tie-break, and that was the only edge the Swiss needed. It was not that Raonic played poorly. In fact, it was quite the opposite. The Canadian, who led the tournament by winning 70 per cent of his second serve points ahead of the final, won 72 per cent of his service points overall and faced just one break point. 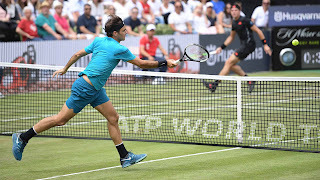 But on the biggest points, the Swiss was in control of the pace of play, either choosing to swoop into net for a putaway volley, or moving the 27-year-old around the baseline. "I played great in the big moments," Federer said. "At the end, I played some of my best tennis. It's a great feeling." Federer showed an astute use of tactics in his final service game before the second-set tie-break. The Canadian earned a 0/30 advantage, threatening to send the final to a deciding set. But Federer hit four consecutive serves to Raonic's forehand - three of which were first serves - capturing each of the points without a return coming back into the court. The 36-year-old served well all day, winning 86 per cent (38/44) of first-serve points. And while he hit only four aces, Federer kept his opponent off balance, holding to love four times. "I had some chances today but couldn’t convert them. All in all it was very positive for me and I hope to keep that trend going," Raonic said. "I’m not far off from my best grass tennis. Maybe I’m lacking the confidence for the right decision still. I hit the ball well, my service is good. Maybe I need a few more matches to get the confidence to make the right decisions in a split second."